If you miss this year’s ISHAM Congress, you would have to wait till 2021 to attend the next one! That’s because the congress holds every three years. It provides clinicians, scientists and students an exciting opportunity to meet at an international forum dedicated solely to the study of medical mycology. This year’s congress holds from 30th June to July 4th but the pre-congress workshops have already kicked off. MMSN president, Dr Oladele made a presentation and also chaired a session at the workshop Onygenales. Onygenales. The ascomycete order Onygenales is important to medical mycologists because it includes the sexual stages of the true fungal pathogens of humans and animals (i.e the dermatophytes and the dimorphic fungi capable of causing diseases in an otherwise healthy host). The order includes three families of medically relevant fungi, namely: Arthrodermataceae including dermatophytes; Onygenaceae including the dimorphic fungi; and Gymnoascaceae. Some of the pioneer research of the MMSN centred around histoplasmosis. Now you know why Onygenales is of interest to us! 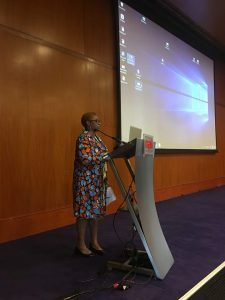 MMSN president, Dr Rita Oladele presenting at the pre-congress workshop in Amsterdam. Author Rita OladelePosted on June 29, 2018 Categories MM NigeriaLeave a comment on Onyge-what now?! Cryptococcal meningitis (CM) is associated with a high rate of mortality among people living with HIV/AIDS. Despite the use of antiretroviral therapy, which has greatly reduced the incidence of CM globally, the death toll from this fungal infection continues to be high in sub-Saharan Africa. Estimates show that Nigeria has the highest burden of CM worldwide. Setraline, an anti-depressant drug has shown great promise as an anti-cryptococcal agent. According to a study conducted by Zhai et al and published in the journal Antimicrobial agents and chemotherapy, setraline is potently fungicidal against Cryptococcus isolates in vitro, acts synergistically with fluconazole in vitro and , in a murine model, a combination of straline and fluconazole is more effective than either drug alone due to their strong synergy in vivo.1 Treviño-Rangel et al 2, likewise demonstrated the efficacy of setraline against Cryptococcus both in vitro and in vivo in a murine model. Rhein et al went further to test the safety and microbiological efficacy of adjunctive setraline in HIV-infected patients with CM in Uganda.3 Their study, published in the Lancet demonstrated participants who received sertraline had faster cryptococcal CSF clearance and a lower incidence of immune reconstitution inflammatory syndrome and relapse than that reported in the past. They concluded that this inexpensive and off-patent oral medication is a promising adjunctive antifungal therapy. 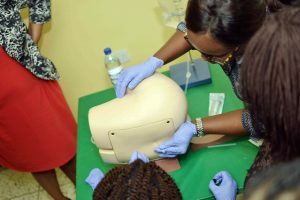 The Medical Mycology Society of Nigeria has begun a series of training activities in tertiary centers across the country. The focus is on Cryptococcal screening and treatment in the setting of HIV infection. 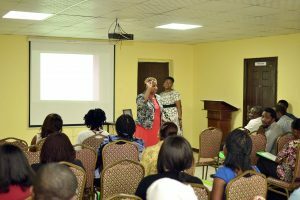 Sessions have been delivered at Lagos, Jos and Ekiti. 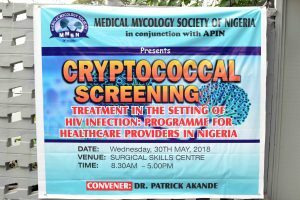 At an estimated 27,100 cases annually, Nigeria is considered to have the largest burden of cryptococcal meningitis globally. 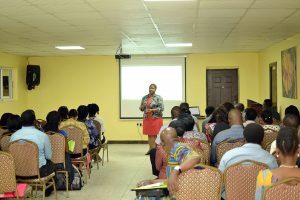 These training sessions, sponsored by the Center for Disease Control (CDC), Atlanta, Georgia are aimed at building capacity for improved management of cryptococcal meningitis. 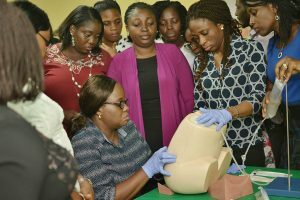 Healthcare providers in seven more institutions will receive training before the end of the year. 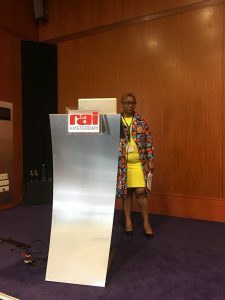 MMSN President, Dr R. Oladele presenting a session.